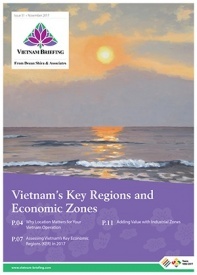 On 22nd May 2018, the Vietnamese government issued Decree No.82/2018/ND-CP (“Decree 82”) to regulate the management of industrial zones (IZ) and economic zones (EZ) in Vietnam. Decree 82 will be in effect from July 10, 2018, and will replace Decree No. 29/2008/ND-CP. According to Decree 82, an industrial park is an area with a defined geographical boundary, specializing in the production of industrial goods and services for industrial production. It includes export processing zones, supporting industrial parks, and eco-industrial parks. Supporting industrial parks are industrial parks that are involved in the production of supporting industrial products or services for the production of such products. Eco-industrial parks are industrial parks engaged in the efficient use of natural resources and environmentally friendly production. Expenses incurred in investments for the construction, operation or rent of apartment buildings and social infrastructure facilities for workers in IZs or EZs will be deductible expenses when calculating taxable income. In addition, they will enjoy preferences as provided in the law on the construction of affordable housing. As per Decree 82, investment projects focusing on the infrastructure development of IZs in areas with difficult socio-economic conditions will get capital support from the central budget. The Provincial People’s Committees will also support investors through local budgets in the development of technical infrastructure systems inside and outside the IZ and arrange other sources of capital for the construction of industrial park infrastructure. Large-scale infrastructure investment projects, which are important for the development of economic zones, can mobilize capital by issuing bonds in accordance with the provisions of law. Exchange of information related to the technology market and cooperation in the field of production and business activities of enterprises. Under the previous regulations, an export-processing enterprise was required to establish a branch separate from the enterprise and outside the export-processing zone, to conduct the purchase and sale of goods. Now under Decree 82, they have a second option. They can also open a separate accounting book for turnover and expenses related to their operations and arrange separate storage areas for goods intended for purchase or sale and production activities. The residence must be separate from the offices/production areas and meet the standards as specified in the law on construction in housing. It also should not affect the operation of industrial parks and export processing zones. Decree 82 which will take effect from July 10, 2018, will replace Decree No. 29/2008/ND-CP and subsequent decrees, Decree No. 164/2013/ND-CP and Decree No. 114/2015/ND-CP.